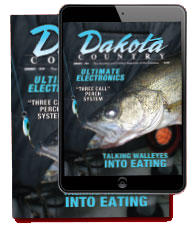 It’s been several years since Dakota Country magazine conducted a survey of any kind among its readers. We thought it would be interesting once again to ask our readership a group of selected questions about their fishing world, and then share them with everyone. A lot has changed since our last survey about 20 years ago. Technology has taken over the fishing world, yet the basics remain the same. We’ve changed, fish have not. So, we’d like to know what you think about things -- your thoughts on fishing, how you approach it, what it means to you, how intense you are about it. Following is a list of questions we’re asking of readers. 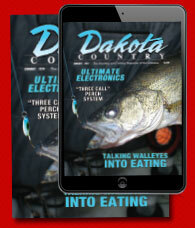 The questions are also available on our website at www.dakotacountrymagazine.com. Please take a moment to review them and send us your thoughts. The results will be published in the 2016 Special Spring Edition of Dakota Country in April. In addition, from those who respond, a winner will be drawn for an Abu Garcia reel. To be eligible for that, you’ll need to include your name and address, but that part is not necessary to complete the survey. 1. How many years have you been fishing? 2. How many days a year do you fish, including ice fishing? 3. What is your favorite fish? Second favorite fish? 6. How would you rate the Dakotas or your home area for quality of fishing on a scale of 1-10, with 10 being the best. 7. Would you rather catch a 2 lb. crappie or an 8 lb. walleye? 8. Would you rather catch an 8 lb. walleye or a 20 lb. pike? 9. Would you rather catch a dozen 2 lb. walleyes in a day or one 8-pounder? 11. How many rods/reels do you own? 12. Do you eat any fish besides walleyes? 13. Do you ever fish or pike? How often? 14. Do you ever fish for panfish? How often? 15. Do you travel to other states to fish? 16. Do you own an expensive depth finder (over $500)? 18. How many fishing or outdoor magazines do you subscribe to? 19. Has today’s technology helped you catch more fish? 20. What would you most like to see to improve your fishing opportunities in your home area? Offering High Quality and High Performance.